A new baby is a wonderful gift from the Lord, bringing great joy—but also sleepless nights, constant laundry and, sometimes, total exhaustion. It can be hard to read your Bible and pray. These bite-sized Bible readings from the book of Psalms are designed for you to dip into and be refreshed by the Lord. Also includes real-life stories, practical help and an A-Z of mothering. 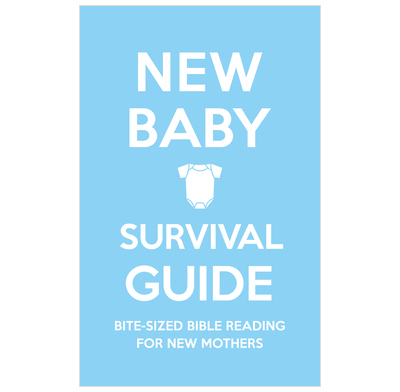 Really useful for new mums, short bible passages with some thoughts for reflection. I found them really helpful for keeping my eyes fixed on God in the exhaustion haze. Thank for the content, ease and efficiency of what you do. Regular customer - I'll no doubt be back! A lovely book to give as a gift for someone with a new baby. Bite size Bible to lift the spirit and calm the soul. A lovely book to give as a present to a new mum. The short bible studies are just enough to take in and full of encouragement. There is also a handy tips section for new parents- full of wisdom. I would really recommend this book.! I have now bought 2 copies of this book to give to friends who are first time mums of young babies. Both said how much they'd appreciated the book especially as they weren't making it out to church services/ meetings. - being great at pointing you to the Lord Jesus at a hard and new time when it's easy not to prioritise God. I gave this to one of the new mums at church who said it was just what she needed. My husband gave me a copy of this book following the birth of our second child. I have found them easy to read each morning whilst also coping with a baby and toddler, but the content is not shallow and encourages all mums to keep their relationship with God going during this difficult time. I will be adding this book to my 'new mums' kit! I love the high quality feel of these books - a bit like a posh notebook you might pick up in Paperchase or John Lewis! The authors' tone in the introduction is friendly and supportive Yet they also challenge new mums to keep feeding on God's word when they get the chance to. There are helpful single-page sections at the back, written by new mums in different situations, including one by a mum whose baby was born with medical problems. I highly recommend!